Two JSU seniors in the College of Science, Engineering and Technology (CSET) captured first place and lucrative six-figure job offers from IBM recently during Blue Hack – an Atlanta hackathon that encourages participants to develop within 30 hours ideas that could potentially solve some of the world’s most pressing issues. The competition encourages innovations such as curing diseases or building an app for global peace. 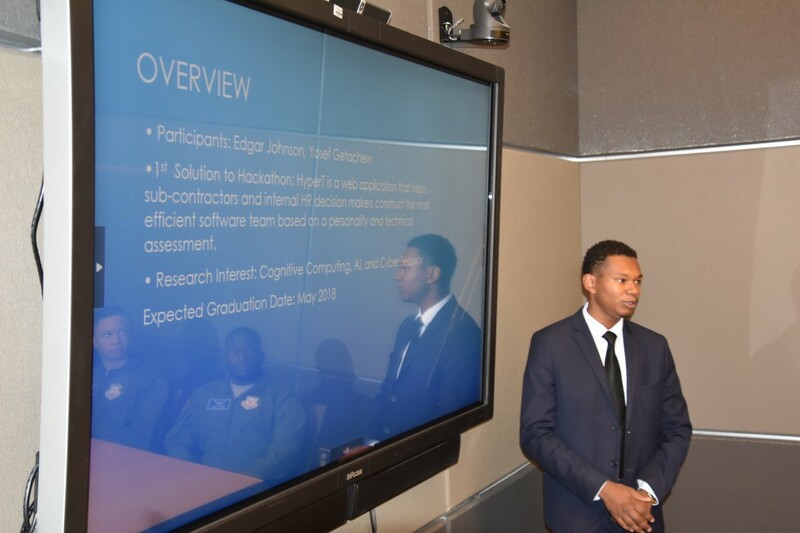 The presentation was tremendously successful for computer engineering major Edgar Johnson, a Chicago native, and computer science major Yosef Getachew, an Ethiopian native. The duo, both 21, developed a web application called HyperT. They received accolades from peers and professional tech experts and a promise of future employment. In other words, the program selects individuals who are an ideal fit to work together on projects that will yield optimum results. Edgar Johnson, a JSU senior computer engineering major from Chicago, co-developed a web application called HyperT that helps build teams for optimum results. With the clock ticking down to complete the assignment in just 30 hours, their idea finally emerged after brainstorming for nearly seven hours and interviewing IBM mentors. Johnson and Getachew learned that many of the IBM employees have experienced being on teams in which they felt they were unequally yoked. “Sadly, this is a recurring problems. People are put on software development teams that are not a good fit for them,” Johnson said. Johnson said the software is not only useful to businesses but can benefit schools and universities. The program’s algorithm helps identify members for group projects by “making sure everyone is on an equal team based on their personality and technical skills,” Johnson said. So, building the best team requires answers to assessment questions such as what programming language a person is most familiar with and comfortable with. The process involved asking individuals to submit an essay for generating personality insights. The algorithm uses data from IBM personality traits API (application programming interface) and a technical survey to generate a total individual score and put people on a software development team that best suits them. Openness - People who like to learn new things and enjoy new experiences usually score high in openness. Openness includes traits such as being insightful and imaginative and having a wide variety of interests. Conscientiousness – People who have a high degree of conscientiousness are reliable and prompt. Traits include being organized, methodic and thorough. Extraversion – Extraverts get energy from interacting with others while introverts get energy from within themselves. Extraverts are energetic, talkative and assertive. Agreeableness – These individuals are friendly, cooperative and compassionate. People with low agreeableness may be more distant. Traits include being kind, affectionate and sympathetic. Neuroticism – Neuroticism is also sometimes called Emotional Stability. This dimension relates to one’s emotional stability and degree of negative emotions. People who score high on neuroticism often experience emotional instability and negative emotions. Traits include being moody and tense. Johnson said a person’s diction is another important aspect of this personality study. “The words a person use can determine the type of person he or she is,” Johnson said. Furthermore, he said it’s possible to determine people’s propensity to engage in violence or crime by analyzing their social media accounts. Once he graduates in the spring, Johnson will begin working for IBM in Cambridge, Mass. He’s already received his award letter detailing a $103,000 annual salary. He’ll be working for IBM on its Watson Health project with Harvard University and the Massachusetts Institute of Technology. The Watson project builds on a partnership between humanity and technology. Johnson is among the highest-paid engineering graduates from JSU. His HyperT partner, Getachew, also received an offer from IBM with similar details.